The concept of a Craft Driven Lodge emerged from the experience of forming Arts & Sciences Lodge No. 792 under the Grand Lodge of Ohio. When a group of masons from central Ohio began to gather to discuss what a Masonic Lodge experience could be, numerous ideas were brought forth from this free and open discussion. Everyone involved seem to share several opinions not the least of which was a sense of disappointment in the superficial treatment of the esoteric aspects of Freemasonry, the deeper meanings of symbolism, and the limited opportunity to discuss and explore these topics within a tiled Lodge. As we began to gather and discuss these matters, it became clear that we were following a process whereby every member involved was viewed as an equal partner in this project and that the directions, goals, and implementation would be driven by every person involved and, therefore, would be the responsibility of everyone involved. The purpose of this volume is to set forth fundamental principles that are essential to the long-term health and well-being of any organization including Masonic lodges. In addition, I will present a review the process followed by this group of brothers that eventually resulted in the formation of Arts & Sciences Lodge No. 792 under the Grand Lodge of Ohio. The general concepts that drove this process, the actions taken by numerous members of this group, the decisions that were made, and the challenges of implementation will be presented to the reader. It is hoped that you will understand the process and see the application of these principles to your own situation be it an individual who is interested in bringing a different quality to the experience in his Lodge, a group of officers wishing to help their Lodge move in a different, more energizing and relevant direction, or for a group of brothers interested in starting with a clean slate and forming a new Lodge. In all cases, the fundamental principles of the Craft Driven Lodge concepts are equally applicable. 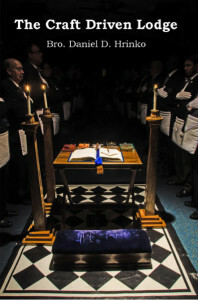 The most attractive qualities of the Craft Driven Lodge approach is that it allows brothers to identify their particular interests, their particular resources, and empowers them to create a Lodge experience that is to their liking without being tied to any particular set of actions, ceremonies, or even fundamental beliefs beyond those universal to Speculative Freemasonry across the globe. Brothers following this process are free to choose from the numerous practices that have been developed as part of Speculative Freemasonry across the ages and choose those elements that are most consistent with their vision of what a Lodge experience should be. For more information, you may also refer to our facebook page, which will also post upcoming events, speaking engagements, and a question and answer forum. Please note: A 25% discount is available when 5 or more books are purchased at one time through Macoy Publishing. Copyright © 2015 The Craft Driven Lodge. Site Designed by naugraphics. All Rights Reserved.